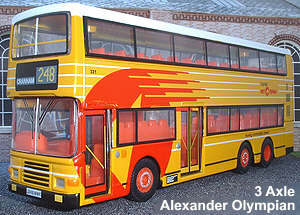 The 3 axle Alexander double deck bus was the first casting in the OOC range based on a Hong Kong vehicle. The model has been produced in both Leyland & Volvo badged versions. The vast majority of the releases have been commissioned by Hong Kong operators themselves, and most of these have initially been released in Hong Kong with UK releases of some following sometime afterwards mostly via Corgi Gold Star stockist's. More comprehensive details of all the Oriental OOC models can be found at Oriental Model Buses along with a larger selection of pictures.